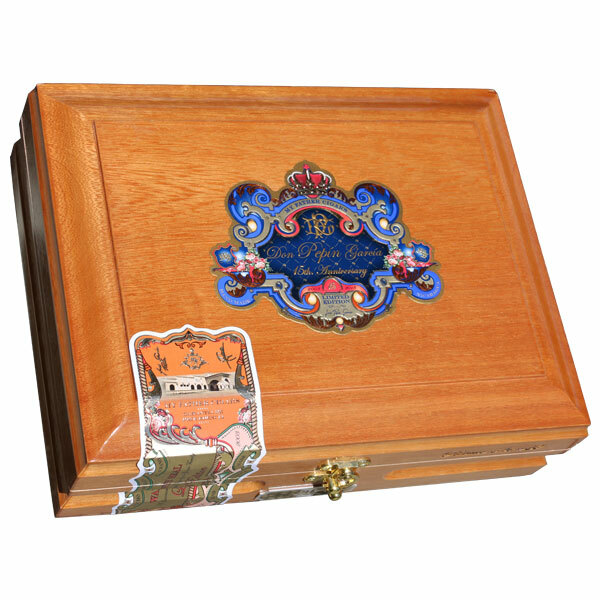 Buy Don Pepín García 15th Anniversary Limited Edition Cigars Online! Long before the García family and their acclaimed My Father Cigars brand were household names, Cuban artisan Don José "Pepín" García began rolling cigars out of a small, humble store front in Miami's Little Havana neighborhood. Of course, Pepín had begun his tobacco career in Cuba long before, where he was frequently praised as one of the island's most skilled torcedores. Pepín began attracting attention from the U.S. market for his work on Tatuaje cigars, and his own, self-titled cigars followed shortly thereafter. Now, as the company did for Pepín's 10th anniversary, another limited edition project has been rolled to commemorate his monumental 15 years since debuting in Miami. Don Pepín García 15th Anniversary Limited Edition is built entirely from Nicaraguan tobaccos, each of which have been carefully aged for upwards of three years. Tobaccos have been harvested from the García's own farms in the La Estrella and El Pedrero zones of Estelí, including a special Pelo d'Oro varietal that is known to be difficult to grow, yet produces fantastic results. Finally, the cigars are wrapped in a Nicaraguan Habano Rosado Oscuro leaf and rolled in both toro and robusto formats, with only 2,000 boxes of each size in existence. Cigar enthusiasts continue to tell tales of the legendary 10th Anniversary LE from 2013, and similar results are expected from the Don Pepín García 15th Anniversary Limited Edition -- don't let this one get away!